Cut water melon into one inch wheels. Then cut a “V Shape” pie slice out of the wheels. You can leave the rind on for color and interest. Now skin the pineapple but do not core. Cut the pine apple into one inch strips length wise. Again cut the strips into “V Shape” pie wedges the same size as the watermelon. One a dessert plate, place the watermelon slice down first. Then stack the pineapple on the top as a second later. Add a nice spread of heavy whipped cream. Then place your raspberries and blueberries on top. That’s it. 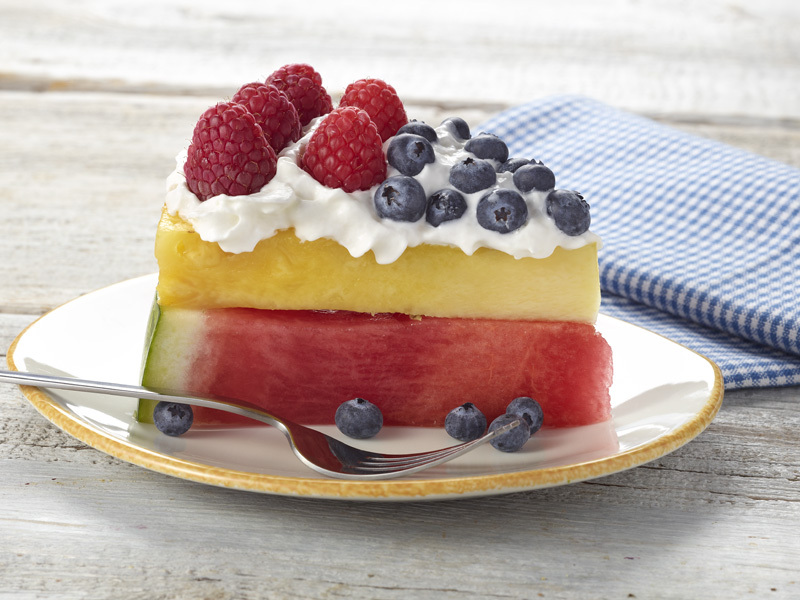 A fresh take on a fruit pie. It is healthy and delicious.